On 8 May 1916, a child was born as so many other children were born. Born to ordinary parents – a lawyer father, a home maker mother, Balan went to school like all kids do; he would later acquire a degree in English Literature, plunge into the Freedom Movement of India against British rule, be imprisoned, fall frightfully ill, be thrown out of jail for that, be rescued by a strange lady, start writing for a newspaper, make fiery speeches and plan even more fiery exposes and then, all too suddenly abandon all that, for none of them explained to him the purpose of his birth. Clearly, Swami Chinmayananda was an unusual young man. Swami Chinmayananda conducted his first Jnana Yajna (a series of spiritual discourses) in December 1951, at a small temple in Pune, Maharashtra. Jnana Yajna, a term he coined from Lord Krishna's teachings in the Shrimad Bhagavad-gita, refers to the student who through scriptural studies performs the ritual of worship (yajna) at the altar of wisdom (jnana). Chinmayananda is known for teaching Bhagavad gita, the Upanishads, and other ancient Hindu scriptures. From 1951 onward, he spearheaded a global Hindu spiritual and cultural renaissance that popularised the religion's esoteric scriptural texts, teaching them in English all across India and abroad.. An inspired band of devotees thus formed 'Chinmaya Mission' on August 8, 1953. Swami Chinmayananda was the finest leader. He wished to build an institution, not an institute. An institution grows with the people, adapts with time, but stays true to its vision. An institute often loses its purpose with the departure of the leader. 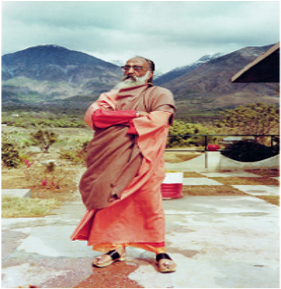 It was Swami Chinmayananda’s desire and intention that after man has led a fruitful, productive life, right from BalaVihar upwards, blending study with seva, he must then step into his third age, where he must apply himself to society via seva and to silencing his inner mind through more study, contemplation and worship. At another level, he envisioned that the reason for the dissonance among the people – around the world, was the absence of a manual for living. Everywhere he was beginning to see an artless rush for living. He decided that the Bhagavad-gita which was the crème de la crème of the Vedas and Upanishads was what begged to be sown back into society everywhere. This journey of unlearning and learning was so enticing for the father and sons that what started as a business dream soon became a lifelong passion. Till date Chinmaya Mission has sent out more than 500 trained teachers of Vedanta and it is this wealth that continues the flow of learning and teaching and knowing in a consistent manner.